With many BHPH customers, the relationship between the dealer and the customer can last for several years. Frazer makes it easy to see the history that you have with a particular customer. By opening a customer’s account in Customer Activity and then clicking on C) General Contact Activity, you can see your history with that customer. You can also add items as they crop up. A quick glance at the window will show what types of information you can display on this screen. You’ll notice just above the buttons at the bottom a series of check boxes to filter the information and display only the items you would like. Note: You can establish defaults for these check boxes by clicking on the gear icon in the bottom right hand corner. General Contact Activity is not limited to just auto generated messages from Frazer. You can also create your own messages by clicking on the “Add” button at the bottom. 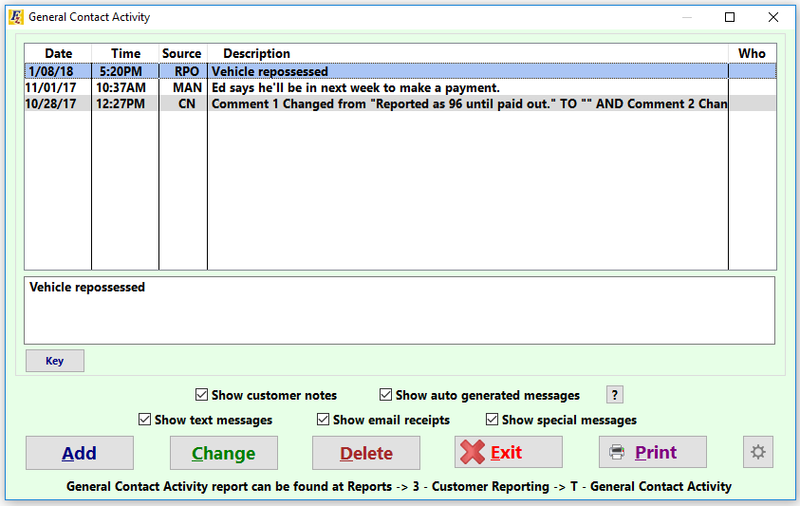 Examples of messages you may type might include “Called customer, promised to pay next week” or “Having engine issues, will bring car in for inspection.” The possibilities are endless! You also have the option to “Change” or “Delete” messages from this screen. (If a message gets deleted by accident, you can see a log of these messages by clicking on the gear icon and then “View Deleted Activity”). Frazer’s automatic posts are also color-coded for ease of discovery. For the key on what the different colors mean, click on “Key”. The key will provide all of your answers to what the different colored messages mean as well as a key for the various sources of your message. Using the “General Contact Activity” for prospective sales. 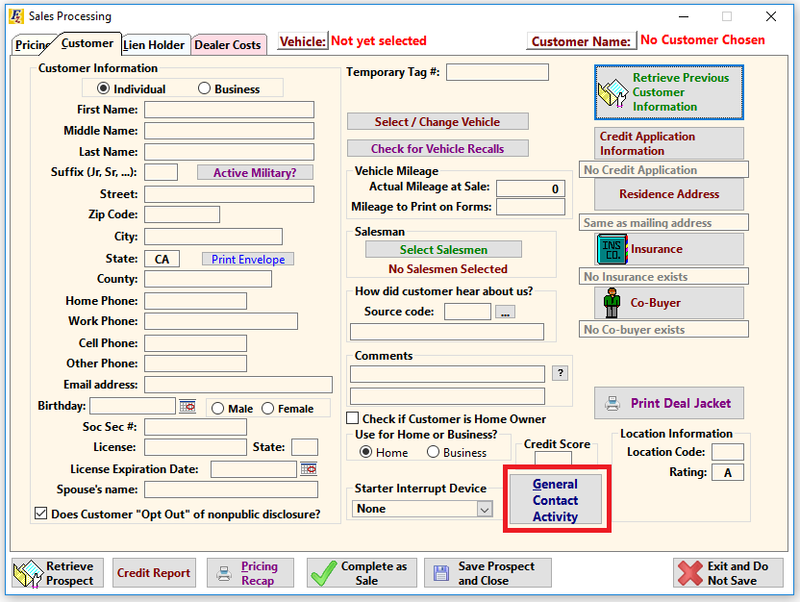 Frazer makes the “General Contact Activity” button available on the “Customer” tab of the “Sales Processing” window. When attempting to access the button, the system will prompt you to save the sale as a prospect.